Caroline’s first jobs in London, after moving from Lancashire in 1978, were in bookselling and publishing. 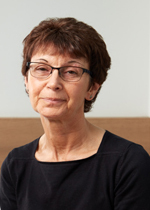 She took up her first PA position in 1980 and has since worked in that capacity for several not-for-profit organisations, including the Audit Commission, the Sainsbury Family Charitable Trusts and the Stroke Association. Before joining PHF, she worked at Addenbrooke’s Hospital as Senior Corporate Committee Secretary for Cambridge University Hospitals NHS Foundation Trust. She has also worked voluntarily as a bereavement counsellor for Cruse and the Sudden Death Association.